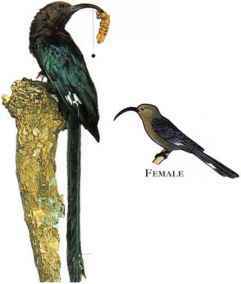 A slender bird, the Scimitarbill is adapted for foraging and clambering among trees. The legs are short and the feet strong, with sharp claws for maintaining a strong grip on the bark. It is agile and acrobatic and often feeds while hanging upside down. The plumage is dark, glossed with violet-blue in the male. Scimitarbills probe holes and crevices with their long, slender, curved bills in search of beetles and spiders, and also catch large insects such as preying mantises. They use their long tails to support themselves while feeding. They have rounded wings, and this species has a white wingbar that is revealed in flight. 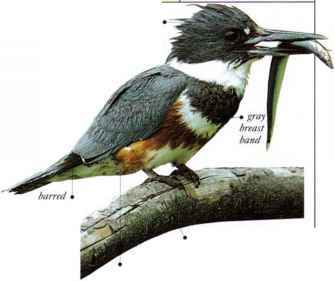 It lives in trees in woodland and dry, open scrub, usually occurring singly or in pairs, and nesting in isolated pairs. However, it often joins parties of mixed bird species feeding in woodland. The call is a series of plaintive w histles. • NEST A narrow hollow in a tree trunk. • DISTKIBI ITION I'rom Somalia and Kenya through !■:. Africa to Angola and southern \frica.